Professional Fighters League is set for its first event of 2018. 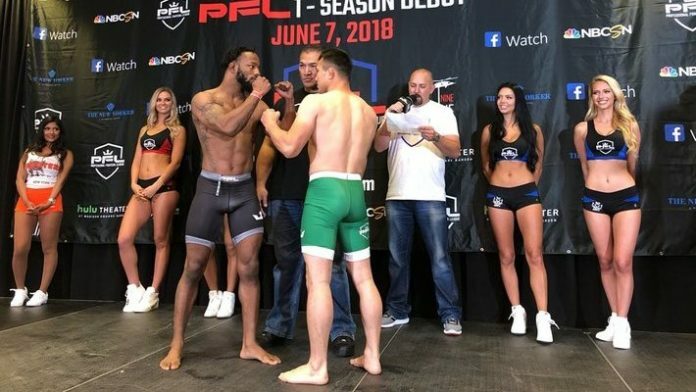 Tonight (June 7), PFL 1 takes place at Hulu Theater inside Madison Square Garden in New York City. While PFL has had some fight night events before, this will be the promotion’s 2018 season opener. This card will see action from just two divisions, those being featherweights and heavyweights. The main event will see former World Series of Fighting featherweight title holder Andre Harrison take on Jumabieke Tuerxun. While Harrison is undefeated, he had to relinquish his PFL title due to the start of season one. He’ll look to start the season strong as there is a $1 million prize if he wins the season in his division. The co-main event will feature a former WSOF featherweight title holder. Lance Palmer hopes to eventually get a rematch with Harrison, but he must first take out Bekbulat Magomedov.